The ideal Microscan reader accessory for any users seeking an easy connectivity option. 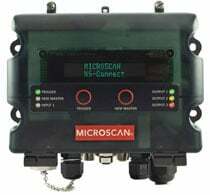 The MS-Connect 210 simplifies connectivity of Microscan readers in industrial applications. This factory floor ready wiring box features a vivid display, convenient access holes for easy wire routing, and multiple connectivity options including Ethernet protocols. The Microscan FIS-0210-0001G is also known as Microscan Systems	FIS-0210-0001G	or FIS02100001G	.